The latest generation of Ford Focus Econetic may look familiar on the surface but it boasts some brand new revisions under the skin. Using the newly developed technology it is able to offer the highest fuel economy and lowest CO2 emissions of any Focus to date. 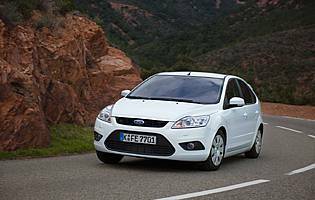 The Ford Focus Econetic was among the first to go down the now familiar path of taking a popular model and wringing as much efficiency out of it as possible. The last generation used a combination of aerodynamic tweaks, gear ratio settings and a 1.6-litre turbocharged diesel engine to achieve a reduction in emissions and increased fuel efficiency. The new model builds on that groundwork with a series of technical developments. The most obvious and perhaps the most influential is the addition of a stop-start system. It cuts the engine out when the car comes to a stop in neutral and re-engages swiftly when the throttle or clutch is depressed. The Focus Econetic is also available without the stop-start system with either the same diesel particulate filter equipped 107bhp engine or a detuned 89bhp variant. Both fail to qualify for tax-free status, however. Other changes have also been made to the 1.6-litre turbocharged diesel unit including the introduction of a new pulley mount for the engine auxiliaries that allows for decreased tension in system and therefore reduced engine load. Clever electrics allow for kinetic energy recovery, too. Under braking, the Focus Econetic's momentum recharges the battery, reducing the need for the alternator to sap engine strength. As ever, Ford's aim is to achieve the efficiency improvements without affecting the practicality or driving experience of the popular C-segment hatchback. With the exception of slightly reduced ride-height, energy saving tyres and Econetic badging, there's little to distinguish the model from the rest of the Focus range. Based on the most popular Zetec trim level the Econetic offers electric windows, air-conditioning and a practical, family friendly body. The Focus Econetic builds on an already impressive platform with technical innovation to great success. The stop-start system makes a big difference, but combines with other small improvements to make an even greater one. The impressive fuel economy and tax-free status are not to be scoffed at in a C-segment car, particularly given the retained refinement. 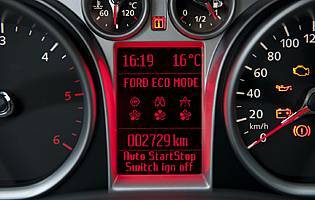 Clearly, the fuel savings must be offset against the purchase price, but for high mileage drivers the Focus Econetic could prove a smart purchase. The Econetic plays its trump card when it comes to running costs, offering extremely impressive real world economy in town and on the motorway. It also qualifies for road tax exemption thanks to its 99g/km CO2 emissions. It's not the cheapest model in the range however, and certainly not the cheapest in the segment, so customers will need to do the maths to see whether the price premium will be repaid by the efficiency over the course of ownership. There's little to complain about in the front part of the Focus' cabin. With enough leg, head and elbowroom for most adults, the cabin is a pleasant place to spend time. There is marginally less space in the rear however, although a decent sized boot accessed via a wide opening tailgate is the pay off with a split-folding rear seat for extra practicality. Elsewhere in the cabin there are numerous, conveniently positioned storage bins, although they tend to be on the small side. Clear and easy to read dials now also include an extra function – the eco-driving trip computer mode that monitors the drivers fuel saving progress. Some might find the red backlighting a little fierce, however. Switchgear feels sturdy and uses a familiar layout, while the controls in general are intuitive to use and sensibly located. The Focus Econetic's lowered suspension does result in a marginally firmer ride, but nowhere near enough to create any discomfort. 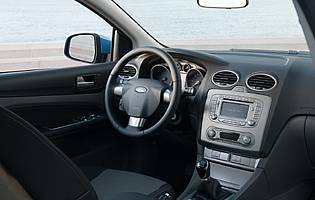 The ride quality remains excellent and there are no complaints regarding the comfort levels of the interior either, with supportive, shapely seats and leather to be found on the steering wheel and gear knob. The start-stop engine system creates a welcome silence when the car comes to a halt, although the vehicle does shudder a little when it re-engages. The security equipment on the Econetic includes remote central locking with deadlocks and an engine immobiliser. A perimeter alarm is a welcome new standard addition to the range. Driver and front passenger, front side impact and front and rear curtain airbags are standard issue for the Econetic model, as is ESP and ABS brakes with brakeforce distribution. The hazard warning lights are also automatically activated under heavy braking. 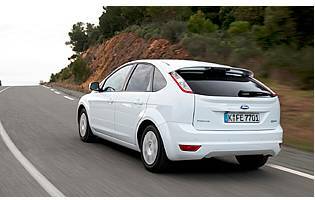 The Focus is well regarded as one of the finest handling vehicles in its segment and little has changed with the new Econetic model. The lowered suspension actually reduces body roll complimenting the responsive and agile steering feel. Economy tyres offer a little less grip, but it remains an engaging drive on a twisty B-road despite the eco-intentions. The 1.6-litre diesel engine offers strong performance with little effort needed to exploit its low-down torque, although allowing the turbo to fall away will induce a lack of immediate power delivery. With no space or practicality sacrifices the Focus Econetic is every bit as useful as a family vehicle as the rest of the range. A large boot is a very attractive family proposition and the rear will cope comfortably with three children. Families will need to calculate whether they cover enough miles to make the premium worth paying over a standard model, however. The Focus does make a sound first car if you don't fancy the confines of a supermini and the road tax-free status and excellent fuel economy help keep costs low. However, the initial purchase price may prove a limiting factor for younger drivers and they may need to do high miles to make it pay. The Focus is built to a standard that would impress most buyers, with a solid feeling to the switches and trim that is reassuring. The Focus has earned a reputation not only as a class leader in many departments, but also as one of the best cars the company has produced. This is reflected in the number of examples on the road, meaning it's less of an exclusive choice, but it remains a smart one. Front and rear seat occupants will have no trouble getting in or out thanks to the car's wide-opening doors. The high seating position also makes access and egress easy and only the most perceptive of occupants will notice the slightly lower ride height. The tailgate is also easy to open, with a large button hidden beneath the lip and an impressively large and uniform aperture for easy loading. The standard radio/CD player delivers a decent performance and, thanks to its big buttons and display, is intuitive and easy to use. The upgrade path includes a number of options including a flashy Sony-branded unit incorporating an in-dash CD changer and touch-screen sat-nav with Bluetooth compatibility. Basic audio controls are located behind the steering wheel. There are no specific paint options for the Econetic models, meaning customers can take full advantage of the Ford colour palette. Most exterior colours look good on the model but, predictably, it's the various metallics that give the car a more upmarket ambience. Interior trim is based on the popular mid-range Zetec model. It's neatly finished and stylish, if a little unadventurous, and the dark plastics are broken up with metallic touches here and there. Parking the Focus hatch is a relatively straightforward exercise. Forward visibility is good, even if you can't quite see the end of the bonnet, while the view to the rear is more than adequate. Well-measured steering weight requires little effort to turn at low speed and the uniform body shape means there are no major overhangs or flared arches to worry about. If you need more help, rear parking sensors can be selected from the options list. Tyre repair kit fitted as standard.